Across the country and around the world, people will be walking for 27 minutes on Friday morning, one minute to honor the memory of each of the victims of the shooting at Sandy Hook Elementary. As the nation grieves over the lives lost in Newtown, Conn., last Friday, different people have taken different tacts in coping with the senseless murders of 20 young children and six faculty members at Sandy Hook Elementary. Some have become outspoken advocates for for gun control, others have called for greater attention to the mental health issues facing the nation. But some people are looking for ways to express their feelings that don’t require engagement with endless political discourse. One event that has been gaining a lot of attention through social media is the “Walk 27” event, created by Kevin Vanover from Port St. Lucie, Fl. and presented by Above Average Entertainment. Vanover is calling for people across the country to spare 27 minutes on the morning of Friday, Dec. 21, at 9:30 A.M. to walk in memory of those who lost their lives. One minute for each of the victims. The event will also feature bubble blowing in lieu of releasing balloons. 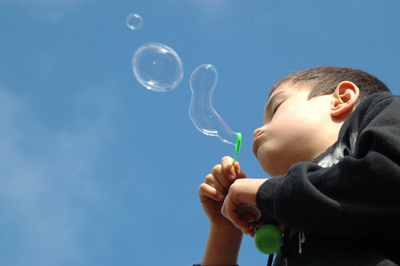 As Vanover said, blowing bubbles requires that you inhale and exhale, which is a great way to release emotions that may be bottled up inside. Vanover also created a Facebook page called Memorial Page for the Victims of Sandy Hook Elementary. "I just wanted to make a memorial page for them, for people to put their dedications and their prayers on the page for them," Vanover told WPTV in Florida. The page has gained 300,000 “likes” in under three days, and the support continues to increase. Participants of Friday’s event are asked to wear green and white, Sandy Hook’s school colors. The event will be taking place in communities across the country and across the world. Vanover requests that you RSVP to the event on Facebook so you can see how many people all over the world will be taking part in the memorial event. Subject: LongIsland.com - Your Name sent you Article details of ""Walk 27" in Memory of the Sandy Hook Elementary Victims"